Pangur Bán is said to be the most famous poem in Old Irish, written about the 9th century at or around Reichenau Abbey. Reichenau Island is in Lake Constance in southern Germany. The Benedictine Abbey of Reichenau was founded in 724 by the itinerant Saint Pirmin, who is said to have fled Spain ahead of the Moorish invaders. The poem was written by an Irish monk about his cat, Pangur Bán. In 8 verses of four lines, the author compares the activities of his cat to his own scholarly activities; Pangur hunts for mice, while the monk hunts for words and knowledge. 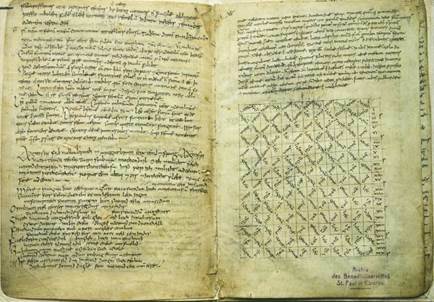 The poem is preserved in the Reichenau Primer, pictured above open to the page with the poem (lower left) and is now kept in St. Paul's Abbey in the Lavanttal. The book appears to have been a practice workbook in which the anonymous monk wrote down Latin hymns, grammatical texts, Greek language declination tables, astronomical tables, as well as Old Irish poems among them Pagur Bán. It is written in insular script similar to that in more famous works like the Book of Kells. The style of the poem is said to be similar to the poetry of Sedulius Scottus. Scotus was, during the reign of the Emperor Lothair (840-855), one of a colony of Irish teachers at Liège. A critical edition of the poem was published in 1903 by Whitley Stokes and John Strachan in the second volume of the Thesaurus Palaeohibernicus. The most famous of the many English translations is that by Robin Flower (below). In W. H. Auden's translation, the poem was set to music (for voice and piano) by Samuel Barber as the eighth of his ten Hermit Songs (1952-3). Fay Sampson wrote a series of children’s books based on the poem. They follow the adventures of Pangur Bán, his friend, Niall the monk, and Finnglas, a Welsh princess. 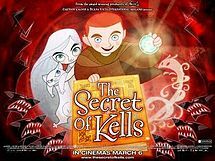 In the 2009 animated movie The Secret of Kells, which is heavily inspired by Irish mythology, one of the supporting characters is a white cat named Pangur Bán who arrives in the company of a monk. It was nominated for the Academy Award for Best Animated Feature. A verse of the poem is read out during the credit roll.